Barrel-aged beers are very popular at the moment (and for the last few years). Go into almost any craft beer bar and you’ll see at least one bottle of barrel-aged beer, and possibly even see some on draught. But why though? Is this something new and exciting that we’re just getting to see? Not really, it’s something we used to do a lot of, but which fell out of favour so much that trying to do some casual research on it brings up nothing much more than what we potentially already know. The first things to get clear are some terminology. A barrel isn’t actually a “thing”, it’s a unit of measurement. Well actually it’s several units of measurement that range from around 100 litres to around 240 litres. Which is quite a difference. So don’t be surprised when one brewery’s barrels are completely different to another’s. Secondly, wood-ageing and barrel-ageing are not the same thing. Wood ageing involves putting pieces of wood into the beer, whereas barrel ageing involves putting the beer into the wood. Wood ageing is faster and more controlled, but often seen as cheating. The third thing to understand is that beer is not stored in wood, it’s aged. This is to do with wooden barrels not being airtight. Metal and plastic barrels don’t allow the beer to “breathe”, whereas wood is semi-permeable and allows for micro-oxidation of the beer. This means that while the beer is in the barrel it starts to react with the wood and absorb some of the chemical compounds, most notably tannin, and will also absorb some of the flavour of the wood and of whatever else may have been stored in the barrel before. The size of the barrel affects the rate of absorption, the more surface area in contact with the beer the quicker the beer takes on notes from the wood, which is why wood-ageing can be quicker than barrel-ageing, especially when using wooden spirals during the fermentation process. The type of wood used affects the flavours; French oak and American oak are the two main types used for barrels. French oak is seen as giving a smoother flavour, while American oak gives a more robust flavour. There’s also Hungarian oak that can provide heavy spice flavours. The inside of the barrels are also toasted to varying levels, lightly toasted giving coconut and fresh oak flavours or medium toasted for rich vanilla notes. Traditionally French oak is used for wine and American oak is used for whiskey. By law in America whiskey barrels have to be fresh each time, and they’re then usually sold on to the Scottish whisky market. When whisky goes into these barrels it’s a clear, unflavoured liquid. It’s the time spent in the wood, absorbing the flavours and aromas of the wood, along with the colour, that gives it its appearance and taste that we have come to know. Wine aged in wooden barrels can take on less of the wood notes, as it’s got more of its own flavours to start with. But the thing is, we used to do this with beer. Breweries up and down the country used to employ coopers. These people would make and repair wooden barrels and casks for the beer. Before stainless steel and then plastic casks, all beer was stored and transported in wood. But the other thing is, as we’ve already seen, beer is not stored in wood. It’s aged. From the moment the beer enters the wooden cask, micro-oxidation starts taking place with the beer reacting with the wood to take on those same aromas, flavours and colours that whiskey does. Bourbon, though, tends to be in the wooden barrels for nine to twelve years, whereas modern beers are usually only in their casks for a few weeks so they’re not going to take those flavours on to anywhere near as much a degree just from the wood alone. This is why if brewers want whiskey (or rum, sherry, wine, tequila, etc.) flavours in their beers, they use casks that have previously aged whiskey (or rum, etc.). 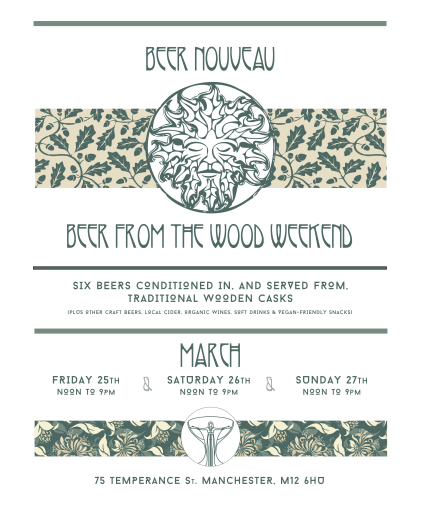 The question is though, how much does the wood affect the flavour of the beer? Some people say not much, some people say a lot. The longer the beer is in the wood the more effect it will have, and as with the difference between wine and whiskey, the style of the beer itself is likely to play a part. Lighter-tasting beers are potentially going to show off the wood flavours better than heavily flavoured beers. 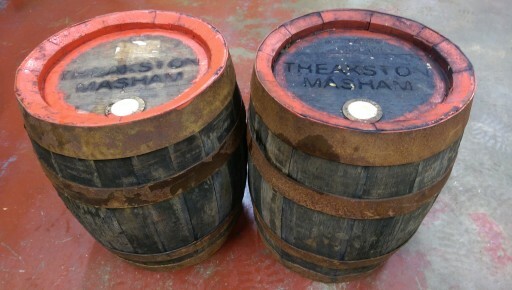 So this is why we’ve bought some wooden casks from Theakstons Brewery (who still employ a full time cooper!). These casks have only had beer in them, but they smell as though they were used to store whiskey! And we’re putting different styles of beers into them to see what happens. The first of these will be tapped for our brewery tap at the start of March, and then over the Easter Bank Holiday weekend we’ll have all six of our wooden pins tapped with different sorts of beers in them. There will be Manchester Sun (our 4.2% golden ale which is what will also be on at the early March brewery tap), Body Snatcher (our best bitter based on an old Boddingtons recipe), Hallé (a 3.9% lager) and Satanic Mills (our acclaimed 6% stout), along with a strong ale and an old ale that we’ve brewed especially to go into the wooden casks. The casks we’ve got are pins, four and a half gallons, which means that there’ll only be about thirty-two pints of each of these beers. We’ve no idea how the beer will taste, and we’ve no idea how busy we’ll be. 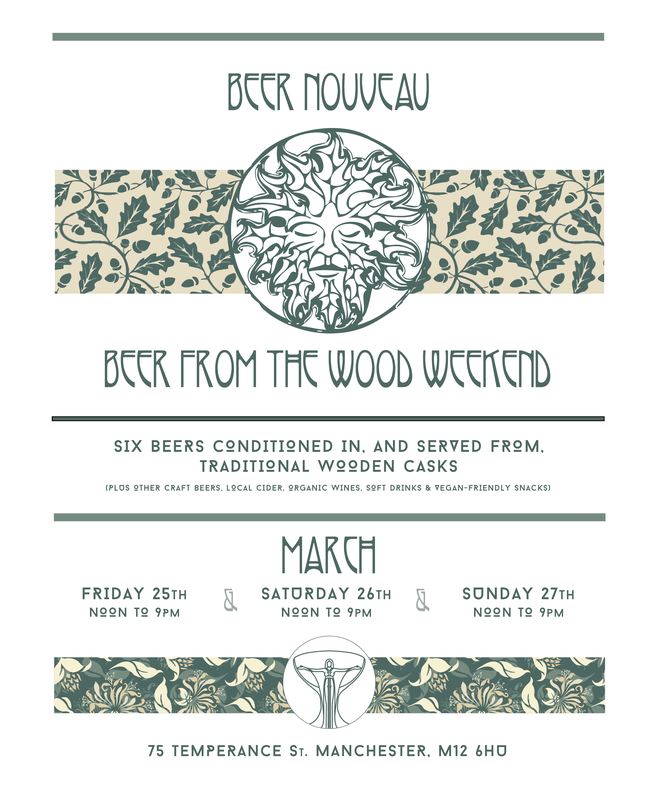 But we’re really looking forward to it, and suggest that if you definitely want to try these beers, you come early! We also have a theory that the use of wooden casks, and the flavours they imparted, is why English hops were cultivated as they were. The vanilla and almond notes from the wood worked with the grassy, earthy notes from the hops to produce much more rounded, robust flavours in the beer. And we’re planning an experiment around this theory later in the year.